The last years have provided insight as to how lymphocytes respond to antigen or xenobiotics, and have increased our understanding of the pathophysiology of renal diseases. This points out new clues on the mechanisms by which chemically-induced immune response trigger immune nephropathies. We will describe the T-cell subsets including Th1 and Th2 cells that may be implicated in renal inflammation. The role of Th1 and Th2 CD4+ T-cell subsets in the development of some nephropathies will be debated. Then, we will evoke the mechanism by which a drug or its metabolites may trigger autoimmunity or hypersensitivity reactions. 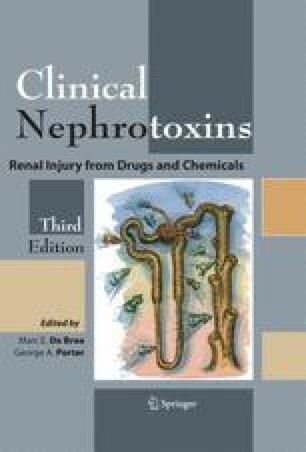 Third, we will report nephropathies induced by xenobiotics in patients, emphasizing the possible underlying mechanisms. Fourth, we will focus on some experimental models of chemical-induced systemic autoimmune diseases that illustrate mechanisms described before. Finally, we will discuss recent insights from these models onto the genetic control of susceptibility to drug-induced immunopathology. This will allow us to introduce the impact of genetic studies in our understanding of the pathogenesis of immune nephropathies, which undoubtedly in the future will shed new light on toxin-induced nephropathies.